more fruits and vegetables to preparing more meals at home. We also learnt from the report that when homeowners are investing in a new kitchen, they prioritise appliances. In fact, 89% say that they will upgrade or replace an appliance in their project. 1. Simply tell us which appliance you would like to incorporate into your kitchen and why. It could be a sleek coffee machine, a clever induction hob, or a brand new dishwasher... Post your comments in the comments section below and share this post on your social media networks. 2. 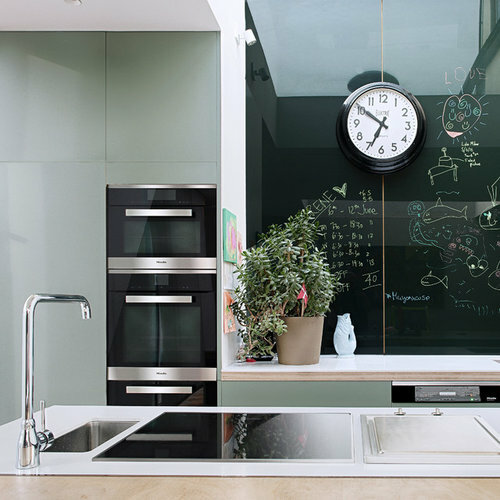 You also need to follow Miele on Houzz. One winner will receive £1,000 (one thousand pounds) towards Miele appliances. The prize is a voucher and can only be used when purchasing appliances directly from Miele. The competition launches 24 February, 2017 and closes at midnight 5 March, 2017. Only Houzzers in England, Scotland and Wales this time. By adding a comment, you're agreeing to our competition terms and conditions. We're about to renovate our kitchen/living/dining rooms into one open plan space and our new kitchen would need to look the part but also work in harmony with the other spaces. So quiet, powerful, sleek in design and reliable Miele appliances would be ideal. We are planning to fit an induction hob with ceiling extractor fan, oven and combination oven/grill/microwave as well as an integrated fridge/freezer into our kitchen design. Fingers crossed they can be from Miele! i could be sensible and say a new dishwasher etc, but what i would love is a wine cooler! they look so cool and lovely to have bottles at the right temp. a dishwasher, would be absolutely fantastic, thanks for the chance. We have a Miele washer and I would love to be able to to get other Miele appliances - they are so reliable. At the moment I think we need a new hob more than anything else, our gas hob was leaking and we had to disconnect it so we are cooking on a single electric induction hob at the moment, a new Miele hob would be amazing! A reliable dishwasher to go in our new kitchen... So I no longer need to be the nominated dishwasher and dryer. I would love an 8kg washing machine as Miele appliances are so reliable and high quality. It would be amazing to own one! We at Dual Designs can supply all of your Miele needs, as well as design and install your complete kitchen. We are soon to update our kitchen and would definitely choose one of their fab ovens, though would also recommend their Perfect Fresh Pro fridges. Thank you all for your comments! The competition finished yesterday at midnight, and we don't accept any more comments to enter the prize draw. I'll keep my fingers crossed that you will be the lucky one! If you're the winner you'll hear from me in a few days. Thank you all for your lovely comments. 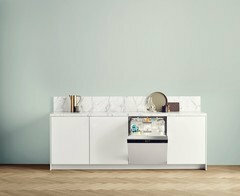 We have enjoyed reading about your kitchen projects and have noticed that many of you are keen to have a Miele dishwasher in your homes. With that in mind, we would like to offer an exclusive Houzz 20% discount across our complete Dishwashing range until the end of March. Please visit https://www.miele.co.uk/domestic/dishwashers-1529.htm and enter code Houzz20 at the checkout to receive your discount. Offer expires 31st March 2017. We also offer free delivery, removal of your old appliance and installation*. *Selected models apply, please call us on 0330 160 6600 (opt3) if you have any queries. Having enjoyed 10+ years with my wonderful Miele fridge freezer, I know these beauties are built to last. However I'm currently living with a washer dryer that seems neither efficient nor effective but was in the kitchen of the house I bought. I'd love to replace it with a top quality Miele version. Good luck everyone! To put an end to the "gas hob looks better" vs " you make to much mess, electric is easier to clean" argument that been bubbling before we order our new kitchen! After four years of trying to find our forever home, we are nearly there! It does need complete gutting though, so a new kitchen with a fabulous induction hob and extractor fan will be very welcome. Good question, Who is the lucky winner? Have you published the winners name? A winner has indeed been chosen and they have been notified. We don't publish their names online, but if you check our Ts and Cs we specify how you can find out. Thanks again for participating! Has the world gone mad, where you can't even let us know who won!! It would have been nice if you had just posted that a winner had been chosen without people having to ask. Whose T & C's are these Miele's or Houzz? I've sent a message to customer service asking them to review this 'send a stamped addressed envelope to find out who the winner was' policy. I don't think Houzz are appreciating the negativity of this policy, publishing name and location of the winner would be good for transparency and a further opportunity to show both Houzz and Miele in positive light. Myself and my two children love cooking fresh, wholesome meals. To be able to do this in a kitchen that isn't 61 years old would be amazing. Trust me, vintage isn't always the way to go! Anything Miele would be amazing, although a dishwasher is high on my list! Has anyone else been notified of the winners? I'm still waiting to receive notification after sending my stamped addressed envelope over 2 weeks ago. The competition gave a lot of publicity to Miele, huge response, it looked like a well run competition.......so who was the winner Houzz? Can anyone advise who the lucky winner was? Sorry for the repeat, a message popped up the first time saying error, but seems to have gone through despite that. This is a bit ambiguous, does it mean as I first thought, that the self-addressed envelope needs to be sent within 30 days i.e. by 30 days after 8th March or does it mean that the notification will be sent within 30 days, in which case I should be receiving notification shortly? Today the stamped addressed envelope I sent was returned to me with a very nice hand written note from Emmeline to say who the winner was, their county and she even volunteered what the winning comment was which was very nice. Thank you Emmeline. I do hope that Houzz policy changes though for all their competitions and survey prizes, so we are automatically notified of winners in the future. Our current oven is terrible, the buttons barely work and it is just sooo old. It would be amazing to be able to upgrade it and finally have an oven that can be used to its full potential. Oh everything. My Miele washing machine is a dream and I don't want to downgrade to any other brand for my other appliances...may be saving a while though! I'd love anything Miele please! I love all your products and would just love to win something! Never ever had a Miele....would be great to win any Miele appliances, hopefully a single oven as we need 2 of them. It's always been a dream of mine to own a Miele washing machine so my fingers are firmly crossed for this particular dream to come true. We upgraded our kitchen last year but we overlooked the importance of the extractor fan and now we regret it. Would love to be able to upgrade the noisy and dated one we have now with a modern and efficient one. First priority would be a new washing machine/dryer since we are moving to an apartment and don't have the room for both a washing maschine and dryer. I haven't yet owned a Miele appliance, although I have used other people's and know that they are top quality. So I would love my first dishwasher to be a Miele and maybe this would convince my partner that having a dishwasher is an improvement on washing dishes by hand. What's your most trusted brand? What's the most you've spent on art?